Raising awareness throughout the world, Wednesday 20th June is World Refugee Day. The spotlight for the International Table Tennis Federation is the Za’atari Refugee Camp in Jordan, the focal point for this year’s World Table Tennis Day. What has happened since that day when the ITTF Nittaku Dream Building with Refugees project was launched on Friday 6th April? After two months, we see enthusiastic table tennis players and quick learners in Za’atari. They are always keen to improve both practical and theoretical skills, keen to learn English for easier communication with international stakeholders. Also they are keen to have the possibility to engage with Jordan players outside the camp. The equipment, kindly provided by Nittaku for this project, arrived at the end of April. It has now been distributed and is used in the 12 districts of Jordan’s fourth biggest city, established in 2012 to offer shelter to people escaping from the Syrian Civil War. Various non-governmental organisations offer support to refugees in areas such as education, sport, nutrition, health care and many more ways to help them on their way towards a new life away from their home. 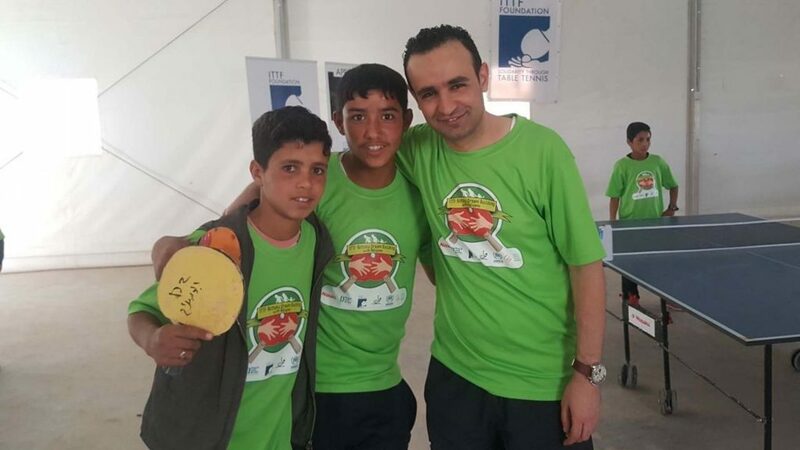 In particular, the ITTF Foundation uses table tennis to promote positive individual change inside the Syrian Refugee community, to increase co-operation and strengthen social cohesion between Syrian refugees and Jordanian people. The training of trainers programme started to work with community centres in December 2017. On World Table Tennis Day, two male coaches were appointed. Present for the launch was Thomas Weikert, ITTF President, alongside Leandro Olvech, ITTF Foundation Director plus ITTF Foundation Ambassadors Ryu Seungmin and Sarah Hanffou. Also attending was the host nation’s Mohammed Atoum, a highly respected ITTF Course Conductor. Another visit is taking place right now; Mohammed Atoum is sharing his expertise about training planning and tournament organization. He aims to stage the first inter district championships in the near future. Now, the aim of the ITTF Foundation is to establish an incentive system for local camp trainers during the next three years, develop self-esteem and confidence in children and youth through table tennis in the long term. ITTF Nittaku Dream Building is organised in co-operation with Peace and Sport, the United Nations High Commissioner for Refugees, International Relief & Development and Questcope.